Lobster Johnson has seen better days. He's being hunted down by the police, who are tired of his vigilante antics. There's a group of mind-controlled masked wrestlers wreaking havoc in the city. His reporter friend is dragging his name through the mud in the newspaper, looking for his secret origin. He doesn't let that get him down though. He picks himself up, crawls through the giant hole his associates blew through the basement, and takes a boat through the sewers of New York City to fight another day. 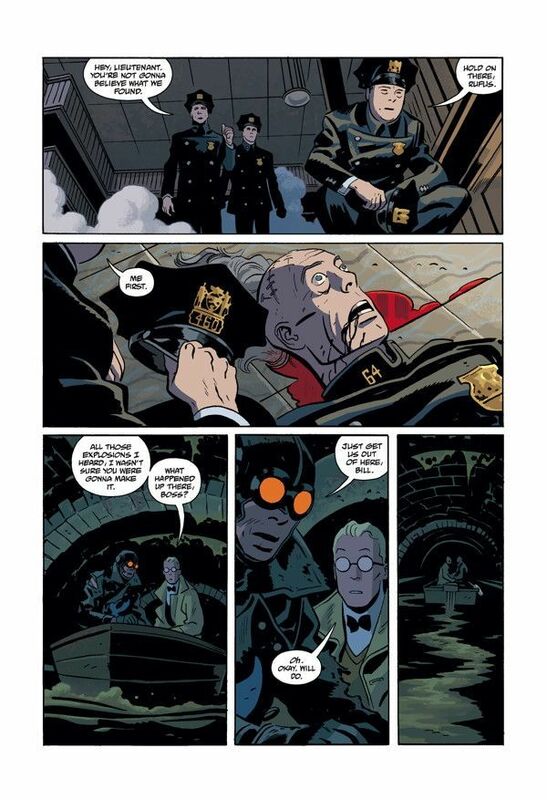 The penultimate chapter of the latest Lobster Johnson series, Get the Lobster!, starts off with our hero in a tight spot, but by the end of it he has reminded you why he's such a badass. Despite all this going on, LJ tracks down the men behind the mind-controlled robberies. This is a very dramatic scene, with two mobsters planning their next move over a miniature replica of Manhattan. Then Lobster Johnson shows up to tear through everything like Godzilla. This is easier said than done though, as there's some muscle protecting the gangsters in the form of a guy with a big robot arm. It sounds less impressive than it is. You have to remember that this comic is set in the 1930s, so a dude with a mechanical arm is pretty crazy. This isn't the Bionic Man here. This battle is absolutely brutal. Although that metal arm is new on him, this thug knows how to wield it. He quickly gets the upper hand and just pummels the crap out of Lobster Johnson. With blood streaming down his face and bones broken, he never stops. This is a hero through and through. He figures out a way to stop this man and goes about exploiting this weakness with precision. Right when you think this is over, something insane happens. I'm not spoiling this because it comes towards the tail end of the comic, but suffice it to say, there's a page in here that reminds me why I love this medium so much. Anything can happen. This is something that wouldn't work in TV or film. It can only work in comics. Those mind-controlled henchmen are pretty rough. As with the guy with the robot arm, this is not cutting edge technology. The head is shaved bald and covered in thick staples or stitches. It's uneven from where the machinery was put into the skull and then covered up with skin and whatever else could hold it together. We have not seen how one of these implants is put in, so the imagination can run wild thinking of what the victim might endure. We do see the aftermath though, and that leaves a soulless husk where a man once stood. Tonci Zonjic's artwork makes me nostalgic for a time period that I wasn't even alive to witness. He pulls in a level of innocence that is seen in almost every character, even the mobsters, that hasn't been seen in this world in decades. This was before WWII and all the horrors that were faced during those battles. Sure, the Great Depression happened, but you could still see a double feature with your favorite dame. This clean look and feel makes it all the more shocking when things get violent. The aforementioned fight of Lobster Johnson and the robot arm dude (I've got to think of a better name for him). The blood that is spilled in that scene hits the page like little explosions, each more jarring than the last, culminating in an almost gut-wrenching moment of violence. Lobster Johnson continues to jump to the top of my pull list every month. It's a solid pulp hero book with a touch of the supernatural (although that aspect is not as pronounced in Get the Lobster!). 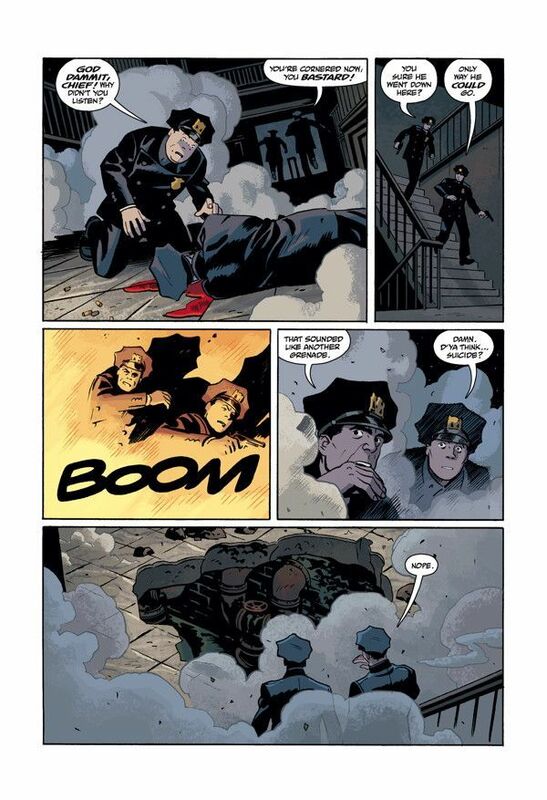 I'd also legitimately kill a man to see a team up between Lobster Johnson and Francesco Francavilla's Black Beetle. Seriously, Dark Horse, what do we have to do to make this happen?